“For the sake of NATO’s future, it will have to focus on terrorism,” @ARVershbow says. The top issues will still likely be how much allies are contributing when NATO Secretary-General Jens Stoltenberg visits the White House for a bilateral meeting with Trump Wednesday. The two will also hold a joint press conference. While contributions will be the priority, issues pertaining to the Middle East, Syria, and the Islamic State will also be high on the agenda. Just before his inauguration, Trump reiterated his view about NATO member countries not investing enough in their own defense. Under the agreement, member nations pledge to spend 2 percent of their gross domestic product on defense. However, many fail to meet their obligations. 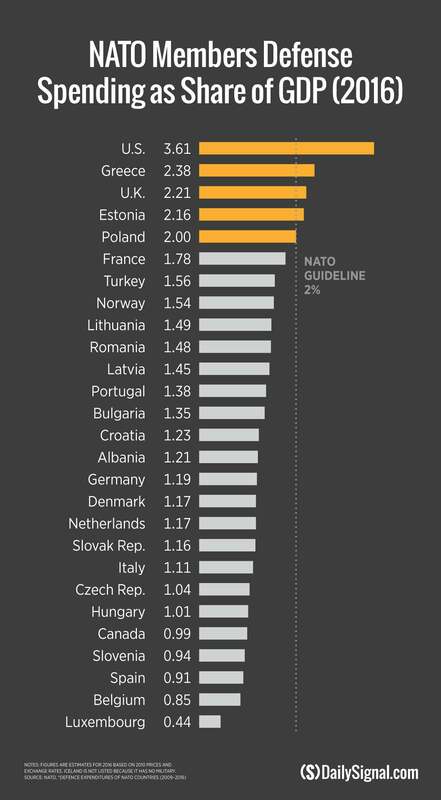 Next year, eight of NATO’s 28 member nations are projected to meet the 2 percent of GDP goal. The previous goal was for each member nation to spend 3 percent on defense, which was determined in 1997. In 2006, that goal declined to 2 percent, Vershbow said. A second priority will be addressing what the alliance can do in the Middle East, said Vershbow, who was a U.S. ambassador to Russia and South Korea under the George W. Bush administration, and ambassador to NATO during the Bill Clinton administration. “For the sake of NATO’s future, it will have to focus on terrorism,” Vershbow said. Vershbow noted the alliance has provided assistance in Afghanistan for the last 15 years. But, he said, NATO has provided only minimal training in Iraq and Jordan for those countries to be self-sufficient against the Islamic State. He said NATO is capable of doing more if asked. There could be limits on NATO’s role in Syria, Thomas Spoehr, director of the Center for National Defense at The Heritage Foundation, told The Daily Signal. Spoehr said that NATO may not have a direct role in Syria. But, he said, member nations, as well as U.S. like-minded countries in the Middle East, would likely join the United States against the Assad regime. 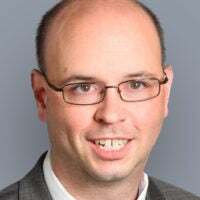 Trump seems to have “evolved as a leader” on international affairs, Spoehr said, stepping away from a dismissive attitude toward NATO. That could be a result of listening to his Cabinet members, Secretary of State Rex Tillerson, and Defense Secretary James Mattis. In NATO, for instance, only four of 28 other member countries, besides America, are spending the minimum required 2 percent of GDP on defense. We have spent trillions of dollars over time—on planes, missiles, ships, equipment—building up our military to provide a strong defense for Europe and Asia. The countries we are defending must pay for the cost of this defense—and, if not, the U.S. must be prepared to let these countries defend themselves. 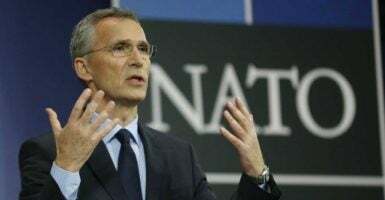 Though his critics accused him of wanting to leave NATO, FactCheck.org stated that was not the case.